I like the idea of grouping the features into modules. I find it inconvenient, in basic structure, to jump between folders such as controllers, filters and views while working on specific module. 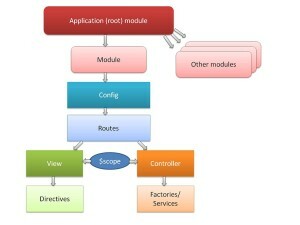 But there are some cases where I need to implement the features which will be reused by other modules. For example, overlay directive, or some filter. I can think of adding new module, let’s say “common” and place all shared features (directives, filters, etc.) into it. Or maybe separating shared features based on their purpose, e.g. directives, filters, etc. Could you advise on how to structure some shared functionality? Yes, in fact, we have a module “common” in our real project where all features are in, that need to be shared across apps. Every app then only declares a requireJS dependency to that module. So if at any other module I only need X or Y service I include either of them and if I need them all then I include the “services” module which already depends on the rest of the services. I do the same thing for directives. Sorry for the double post but I forgot to mention that I also go one step beyond and declare the routes in each of the modules as I like my modules to know everything about the business rules (including the routes where they should work on). Then when I include these modules in my main app, I don’t have to configure anything else. I just plug it in and it just works. This also helps a lot with the testing. It keeps everything in its place. Thanks for sharing and happy coding! That’s “Functional Decomposition”. The most important thing in software development. Interesting, didn’t know the term, but after some googling, yes, it very much looks like functioal decomposition. Very interesting to see, that its thought of a anti-pattern in object-oriented languages or environments. Since angularJs applications are far from object-oriented, I don’t give much about it, but I’ll have to think more about it when we discuss the architecture of our java application next time. I have created this side-by-side comparison of the ways of doing AngularJS work. It includes sections on file organization and module definitions. Please also take a minute to complete the quick survey at the top.